Maltapost is tomorrow issuing a new stamp set featuring five paintings of St George that are found in Maltese churches and chapels. The issue coincides with the liturgical feast of St George. The set has been designed by Joseph Mizzi, and will remain on sale for a year. 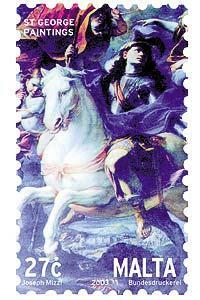 The 3c stamp shows the painting of St George in Hal Millieri chapel, a work attributed to mid-15th century art. The 7c stamp is a painting by Francesco Potenzano (1540- 1599), and is to be found in St John's Co-Cathedral. The 14c stamp depicts a Mattia Preti (1613-1699) in the basilica of St George in Victoria. The second Preti painting in the set - the one in St George's parish church, Qormi - appears on the 19c stamp. Another Preti painting is shown on the 27c stamp. The painting can be found in St John's Co-Cathedral. St George, known as the Great Martyr of the eastern Christian church, lived during the closing decades of the third century AD. St George's cult probably reached the Maltese islands with the Byzantine soldiers. It was later further strengthened under the Normans, with missionaries from the Greek church. Tradition has it that during the siege of Mdina in 1429 St George was seen, together with St Paul and St Agatha, assisting the Maltese against their Muslim besiegers. St George was beheaded on April 23 of the year 303. The church of St Agatha in Rabat has the oldest sculpture of the saint, while Hal Millieri chapel boasts of two 15th century frescoes. Legends about St George fired the imagination of writers and painters, and in less than a century he became a symbol of the struggle between right and evil. Jacopo da Varagine depicted him on horseback slaying the dragon about to devour a defenceless lady. The subject became a favourite in Georgian iconography. Among the most popular are works by Rubens, Murillo, Raffaello, Velasquez and Mattia Preti.